When James Gardner bought his home in 1996, he did not expect his neighborhood would be turned into a new development 20 years later. The small, quiet cul-de-sac known as Robbinswood is a mile east of Interstate 75 and just south of Archer Road behind restaurants like Bento and Chipotle. 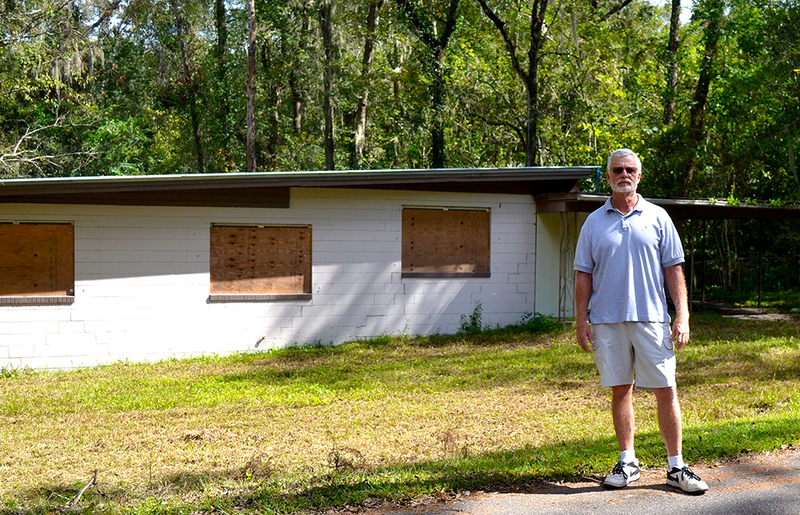 It used to be a vast area of land and woods where Gainesville’s airport once was. 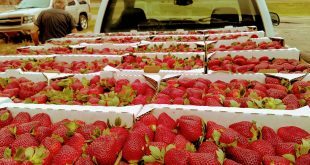 Today, Gardner finds himself living in the middle of what eventually will be a new hotel and shopping center because developers are buying parcels of land all around him. In 2002, the City of Gainesville annexed Robbinswood, and with the annexation came a zoning change. The neighborhood went from being residential to mixed-use, Gardner said. 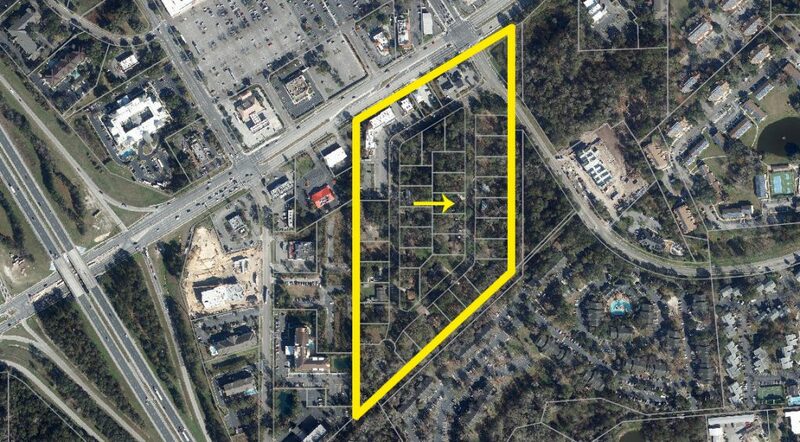 Since then, developers have bought individual parcels of land for what Gardner thinks is below market value. Gardner said Mitch Glaeser, a developer, offered him $150,000 for his home. Other residents in the neighborhood said they have been offered the same amount. 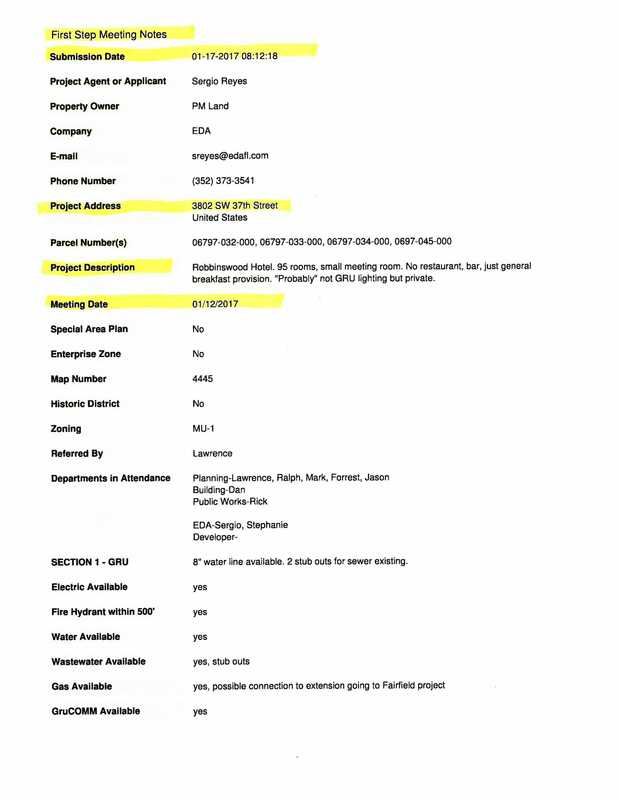 The Alachua County Property Appraiser’s office in 2008 valued Gardner’s property at what turned out to be a peak just value of $204,100. Today, the just value is $86,000. The just value doesn’t account for new buildings that went up in recent months, including within Butler Plaza and Celebration Pointe, which Gardner hopes will add to his property value. 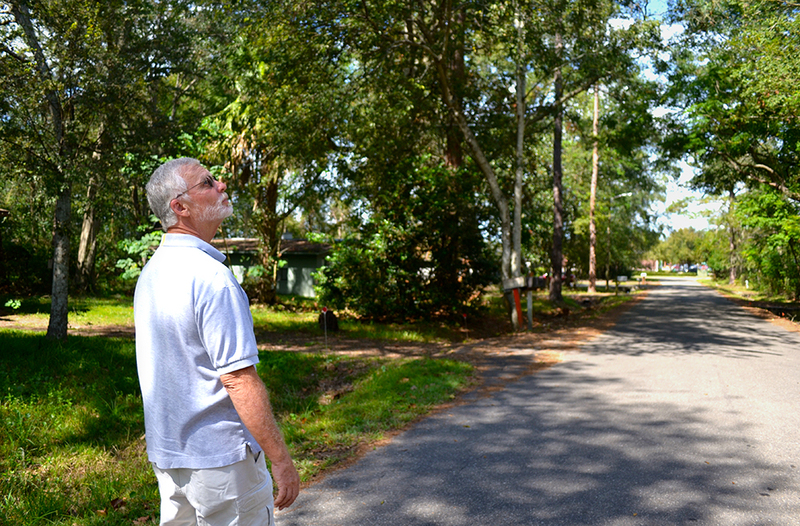 Glaeser owns 14 of the 35 parcels of land in the neighborhood, but his plans for developing the area are on hold for now. 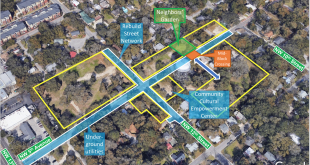 In April 2017, Glaeser submitted a master development plan for Boulevard Station, a retail and restaurant commercial development, according to records from the city of Gainesville’s Department of Doing. Glaeser withdrew the plan in August because he said “there was no reason to build,” with no tenants, negotiations or financing. He has not said when he will resubmit it to the city. 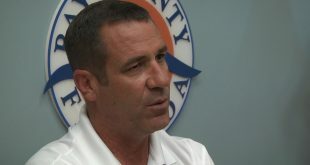 Glaeser said he has not signed any leases or conducted negotiations on the properties and is willing to sell the properties back for the same price for which he bought them. 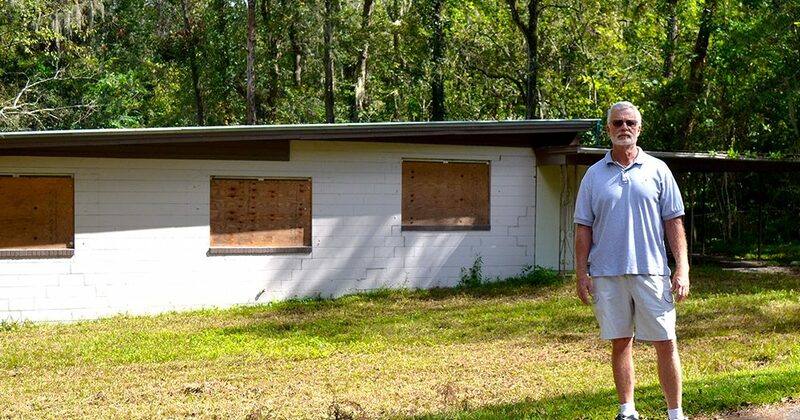 Alachua County Property Appraiser’s office records show another developer, Gainesville Hotel Developers LLC, bought five parcels of land next to Gardner’s home from PM Land, Inc. for $1.1 million, or $220,000 per lot. PM Land, Inc. and EDA, a civil engineering and land surveying company, submitted plans in January to the city’s Department of Doing to develop a 95-room hotel on the corner of 37th Street, according to city records. 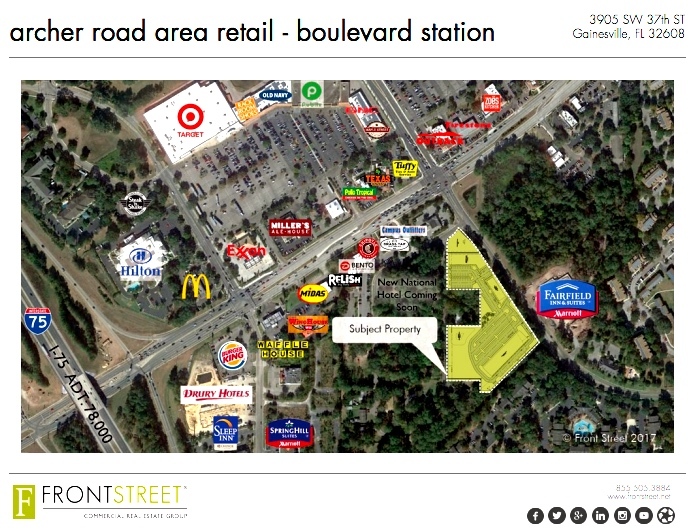 An online brochure posted by Front Street Commercial Real Estate Group shows Glaeser’s proposed development (since withdrawn) and where the 95-room hotel would be built. The hotel has no affiliation to Front Street. The recent proposals for these new developments caused concern for other residents in the neighborhood. One of the biggest worries? Traffic. Donna Ronan, who has lived in Robbinswood since 1982, said traffic getting in and out of her neighborhood is already bad enough, and the more that’s built, the worse it will get. The road to get out of Robbinswood is a two-lane road that connects Archer Road and 37th Boulevard. During peak driving hours, it takes more than 20 minutes to make a left turn, Ronan said. She remembers when Butler Plaza was a tiny strip mall. She said she never expected all these changes and how the new developments would impact her neighborhood. Like Gardner, Ronan said she was not aware that Robbinswood’s zoning would change when they were annexed into the city. City commissioner David Arreola said annexation can happen in two ways: a neighborhood can petition to be annexed into the city or the city can file to annex a certain area and each citizen living in that area will vote on it. Ronan said the residents of Robbinswood had voted against annexing into the city at least three times. The initiative eventually passed in 2002 by a 467-261 vote. Ronan said since the annexation, Robbinswood has become more commercial. Hear reporter Elayza Gonzalez explain the reporting that went into this story on the latest episode of The Point podcast. 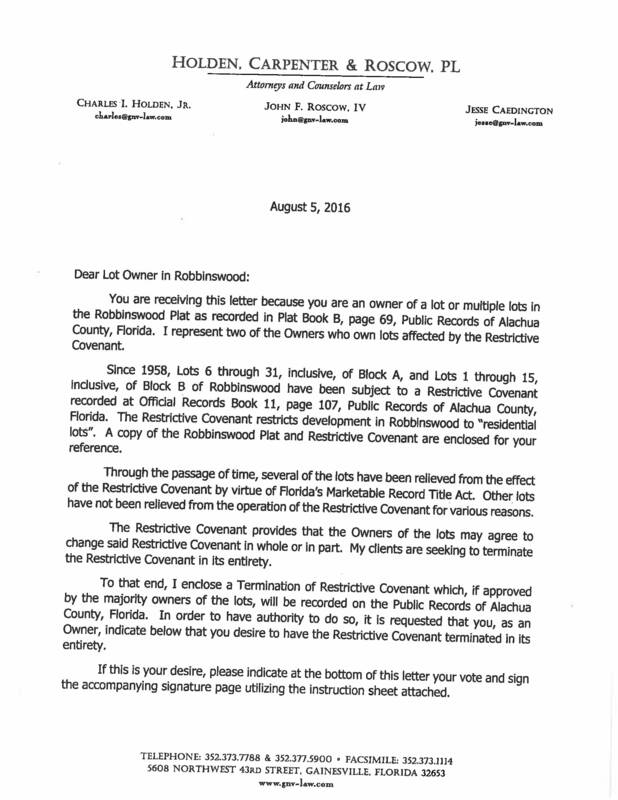 Gardner said from 1958 until 2017 there was something called a restrictive covenant tied to all the properties in the neighborhood, which made Robbinswood strictly residential. 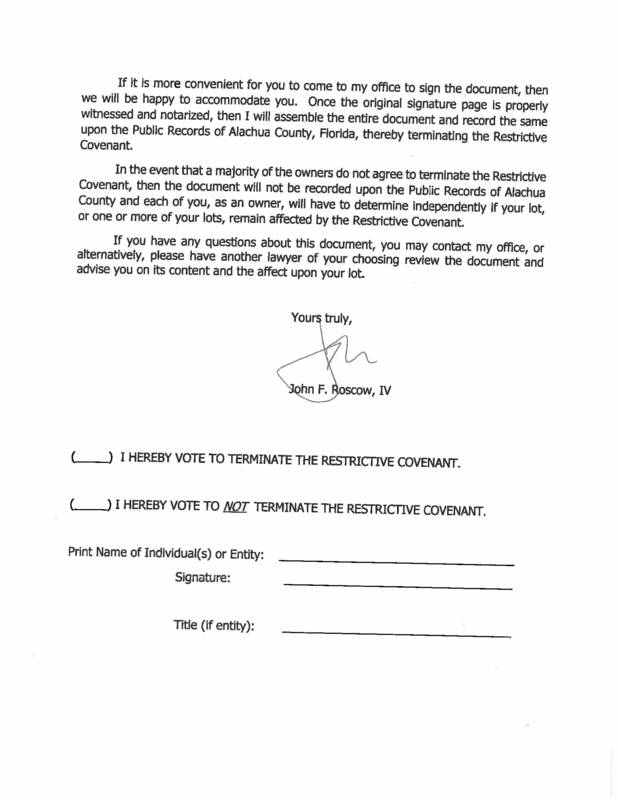 Developers hired lawyers who in August 2016 sent out letters with voting ballots attached asking property owners to rescind the restrictive covenant. 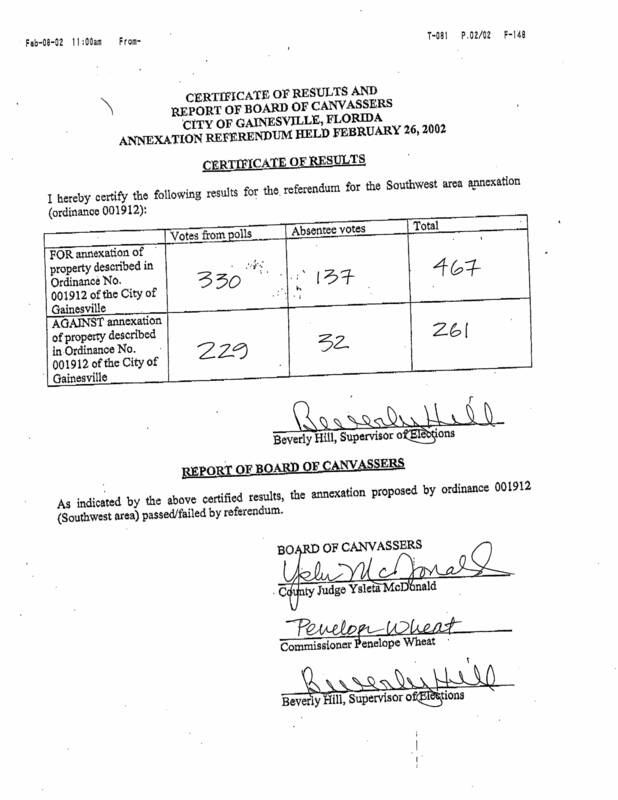 Property owners were given a vote for each parcel they owned, and by then, developers already held most properties; their votes alone were enough to end the covenant. 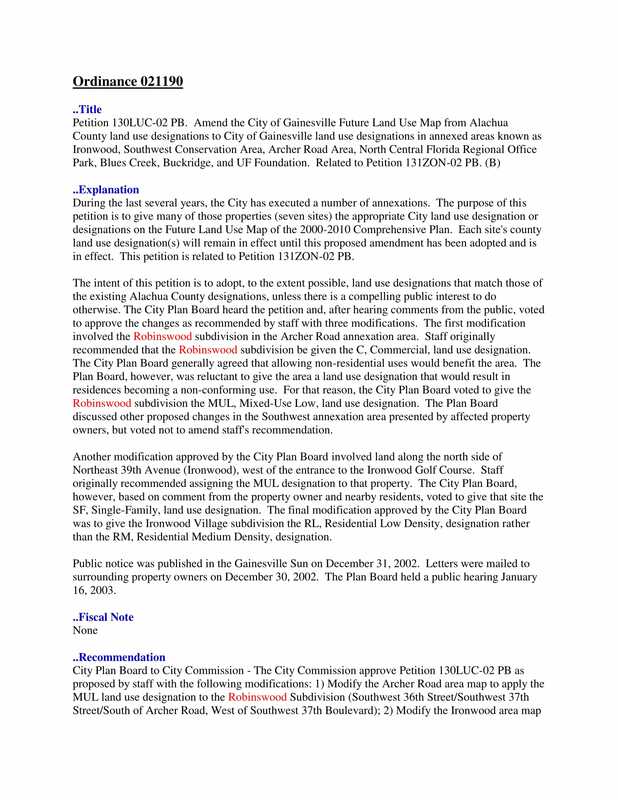 City Commissioner Arreola was not aware of this restrictive covenant but said the city of Gainesville charter gives the city full authority to make changes in zoning as long as it follows Florida’s statutes. He said that as far as he is concerned, these developers have not done anything illegal, nor have they violated any codes, but these new developments do put the residents of Robbinswood in a tough predicament. Arreola also said city commissioners’ goal is to ensure that commercial developments are built in the appropriate areas so the growth is managed to protect residential areas. 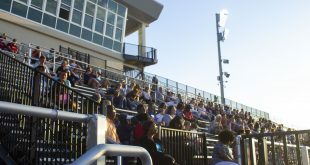 “I’d rather not speculate, but the commissioners who were in office during 2002 probably saw Robbinswood going in a more commercial direction,” he said. In 2002, the city planning board agreed that allowing non-residential uses would benefit that area and the city board voted to give Robbinswood the mixed-use land designation. Now, residents face the decision to either sell their property for what the developers are offering — even if it is not the price they are hoping for — or stay in an area that will soon be consumed by new businesses. Beverly Haynes is another resident of Robbinswood who bought her house in 1994 at an auction. Haynes was still working as a teacher when she renovated the house and began renting it out as a way to continue making an income once she retired. She said Mitch Glaeser offered her $150,000 for the house, which is not near what she thinks it is worth. Haynes feels her home is worth at least $300,000. Glaeser said some of these residents want a price that exceeds their actual property value. According to Bosshardt Realty Services realtor Thomas Mastin, it would be hard for a home in that area to sell for more than $150,000. “The price the developers are offering is a reasonable price considering most homes in Robbinswood are small and have been there since the 1950s,” Mastin said. Mastin said depending on the condition of the home, residents could get about $100 per square foot. Maybe even less. Gardner said he thinks developers are strategically buying individual parcels of land as opposed to the whole neighborhood as a way to block residents in and get them to sell at a lower price. He said that the value of his home would soon be significantly less because he is right at the heart of these proposed developments. Mastin said it is impossible to say how much Gardner’s property value will decrease once the developments are built, but the construction and infill will have a negative impact on the price. Glaeser said he has always conformed to city regulations and has done business according to code. He said he thinks commercial developments enhance a community. Gardner said Gainesville is in a huge transition, and while people will say more building is the wave of the future, he disagrees. Elayza is a reporter for WUFT News and can be reached by calling 305-877-5852 or emailing egonzalez14@ufl.edu.